St Augustine, the theologian, and philosopher, famously posed the question ‘What is time?’ in The Confessions. After waxing on for a bit about what he can say about time he admits (that he’s in a) “sorry state, for I do not even know what I do not know!”. Augustine is not alone. In everyday life, we are probably most familiar with time from two sources: clocks, and our inner psychological experience of time. Clocks are everywhere. There are grandfather clocks, watches, alarm clocks, even incense clocks that let you tell the time through scent. There are also natural clocks. But clocks existed well before the modern invention of portable artificial ones. Over four thousand years ago, the Egyptians used obelisk shadow clocks, sundials, and water clocks which measured time by the flow of water passing through a stone vessel. By 1800 BC, the ancient Babylonians had divided the day into hours, the hour into sixty minutes, and the minute into sixty seconds. All the great civilizations of the past used the positions of the sun or stars to tell the time. Looking at the stars with the naked eye, an ancient astronomer could tell the time to within fifteen minutes. And anyone can tell roughly the time merely by looking up at the sun. We also feel time pass. In addition to the physical time measured by various clocks, there is also psychological time. We have memories of the past and anticipations of the future. And we experience temporal durations of different sizes. We are personally, subjectively aware of time passing. Although people disagree about their feelings of how much time has passed, they also enjoy remarkable agreement about the temporal ordering of events. Except in rare circumstances, everyone (who has the same information available) agrees – for the most part – on the time order of events. There is definitely something objective and independent of a particular person’s feelings about the time ordering. The objectivity of the ordering of events in time proves that there is more to time than just our psychological sense of its passage. There is the fact that events seem to be laid out in a unique and observer-independent succession in time. Maybe all there is to time is clocks. This is actually already a deep question. But, at least at first glance, it seems the answer is “no”, for we often talk about a clock being wrong. You might say my watch is ten minutes slow or even completely off. This may be your excuse for being late for an appointment. But is your watch an infallible guide to time? No, we know it will “lose” a few seconds per year, even if it’s pretty good. Between each “tick” of the clock, we want the same amount of time to pass. 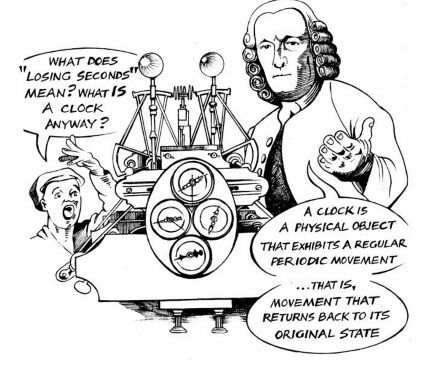 It should be no surprise that pendulums, which have regular periodic motion, can be used as clocks. But pendulums aren’t perfect. On a boat in high seas their motion will be disrupted, or in hot weather they may behave differently than in cold weather. Consider a pendulum swinging back and forth twice. How do we know that the amount of time that passed on its first trip back and forth is the same as the amount of time that passed on its second trip? This question illustrates what the German philosopher Hans Reichenbach (1891 –1953) called the “problem of the uniformity of time”. Firstly, your personal estimations of time won’t be precise enough for science. 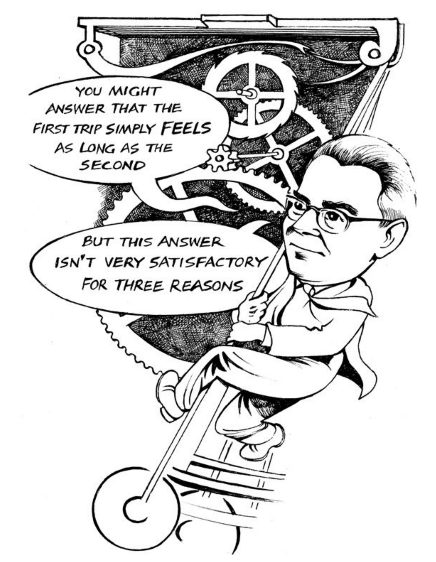 We need to know whether the first trip seemed exactly the same as the second trip. Secondly, your feeling as to the amount of time that passed is subjective. You might say the same amount of time went by, but your friend might not think so. 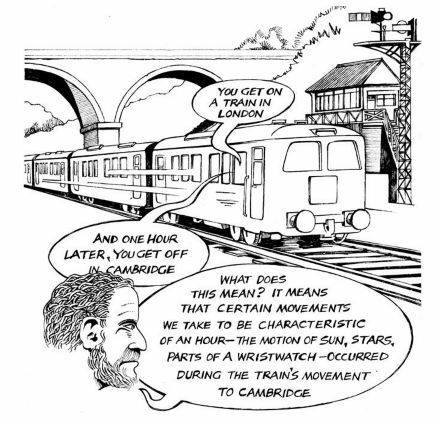 Thirdly, and most importantly, you’re measuring the time that passed with your thoughts, but these are – plausibly – physical processes, and so this merely pushes our question back a step. That is, we would then ask how you know how long your thoughts last? Real time, according to Newton, does not depend on any particular clock, or even any particular material object in the universe. Time is independent of the contents of the universe. It is this time that is used in the unchanging laws of physics. The laws of physics tell things where to be and when to be there. In telling them when to be where, Nature assumes a particular time measure. According to Newton, we shouldn’t confuse any of (our) actual imperfect clocks with the perfect, invisible, clock that is independent of any physical object: Time. Not everyone agrees with Newton. 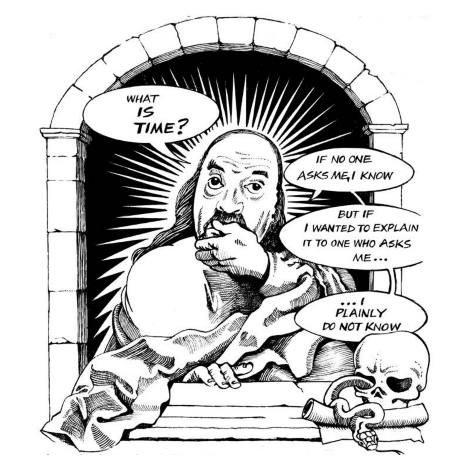 His idea of absolute time continues to be both influential and hugely controversial. 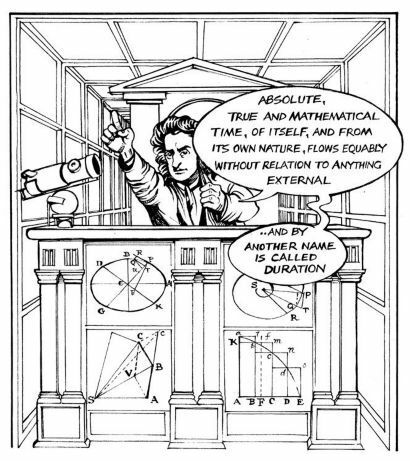 In the language of philosophers of science, Newton is both a Realist-he thinks that the time mentioned in the laws of physics is really Time itself – and an Absolutist–he thinks that time is independent of any particular physical process. Opponents of Absolutism, known as Relationalists, hold that time is essentially just change, or the measure of change. By change we mean change in the relationships between physical objects. Aristotle (384– 322 BC), the Greek philosopher, held that time is simply the measure of motion. Time is the measure of one physical process against another. In this view, contrary to Newton’s, time is dependent on the physical contents of the universe since time is defined via their change. Time for Aristotle is dependent on its sensible measure – actual physical clocks. In the Relationalist view, because time is dependent on physical movement, it seems time doesn’t pass when there is no change. Can we conceive of looking at the stars, having them stop, and still being able to experience time passing? Aristotle considered this question and pointed out that in such a case we’re still measuring the progression of time with our changing thoughts and feelings. We need these to stop too. Because our brains will be frozen too, it is true that we wouldn’t notice the passing of time. Could time pass by nonetheless? It would, if time is independent of change. So, in Newton’s view, it would at least be conceivable for time to pass without any change at all. But according to Relationalism, this is impossible. Time is just the measure of change. No change, no time. 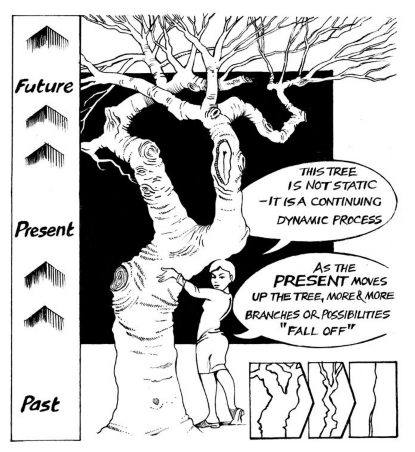 One part of the book that stood out for me was the nature of tensed theory of time, which offers another use of branching. I connected the theory of tensed time to alternative histories. This theory corresponds to our idea that “what’s done is done”, that the past cannot be changed, and that the future can be changed because it is “open”. Try to imagine a life without timekeeping. You probably can’t. You know the month, the year, the day of the week. There is a clock on your wall or the dashboard of your car. You have a schedule, a calendar, a time for dinner or a movie. Yet all around you, timekeeping is ignored. Birds are not late. A dog does not check its watch. Deer do not fret over passing birthdays. Man alone chimes the hour. And, because of this, man alone suffers a paralyzing fear that no other creature endures. A fear of time running out. Introducing Time goes on to further explore the nature of time and our relationship to it.